A copper fire pit brings a sense of designer style and refined elegance to any outdoor space. Our top choices are all made from 100% solid copper for that truly high-end feel. However, we’ve reviewed some of the best fire pits in the past and know that’s where their similarities end. Based on our testing, we found that the Titan Attachments 40” Copper Fire Pit Bowl is the best choice for most backyard patios. It is well built, corrosion resistant and made with superior grade thick copper plate that makes for an incredible outdoor focal point. We’ve put together the table below for a quick and easy comparison of our favorite copper fire pits. Click here to skip straight to our top choice or scroll down to read reviews for our top 5 choices. Our goal is to ensure you get the best copper fire pit that’s not only durable but fits with the overall look and style of your backyard. We know that every copper fire pit is different, each having various finishes, base designs, copper thickness and accessories. These characteristics are all critical when selecting the right copper fire pit for your specific needs. During our reviews we’ve paid particular attention to these factors and made sure to focus upon each and every one. 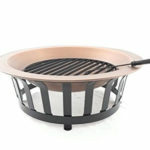 As our top choice, the Titan Attachments Copper Fire Pit Bowl is an incredible additional to any backyard patio. Weighting in at 55 pounds its stunning 40” wide fire bowl is made from premium copper that’s not only thick, but attractive as well. The larger diameter 8” deep bowl allows for logs up to 2’ long, so no fiddling with axes or saws to cut wood to length. Not only that but this unit also includes a coated black steel fire grate for enhanced heat, a more efficient fire and easy cleanup. The grate is complimented by the durable metal base with a wonderful modern design. Made from thick 1/3” thick steel and powder coated to prevent corrosion it’s clearly built to last for year after year. The Titan Copper Fire Pit Bowl also include a handy drain hold in the center to prevent water accumulation if left uncovered. 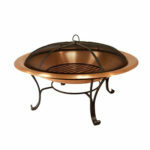 Overall this is a phenomenal choice and in our opinion, the best copper fire pit on the market. With high-end materials, a perfectly sized fire bowl and a modern look you simply can’t go wrong with the Titan Attachments Copper Fire Pit Bowl. With a polished copper finish and a host of included accessories, the Cataline Creations Solid Copper Fire Pit easily makes the cut. We loved the rustic look with just a hint of modern design elements as it fit right in with our existing décor. 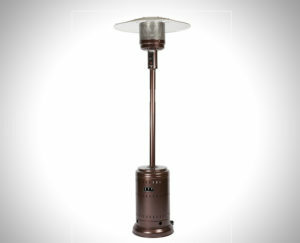 The sturdy steel stand is made from heavy duty steel that can withstand both high temperatures and bad weather. The large fire bowl is available in 30”, 35” and 40” diameters, making it large enough for bigger logs and when lit, puts out a significant amount of heat. The sheer number of included accessories was also a pleasant surprise as well. While it does come with a cover, we’d suggest you grab a more durable one as the fire bowl does not have a drainage hold and any water inside could start to eat away at the copper bottom. 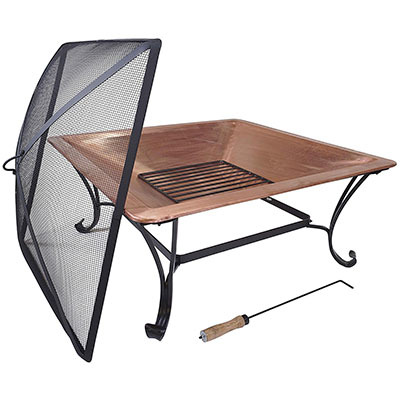 The Catalina Creations Copper Fire pit also comes with a black mesh spark screen, log grate and a handy lifting tool for easy screen removal. In summary this makes for an excellent copper fire pit that is a bit lower in cost, yet still has it where it counts. We loved the included accessories and though they did a great job at adding value to this product. If the copper fire bowl was a bit thicker this could have been our number one choice. Whether your roasting marshmallow in the backyard, singing around the fire in the forest, or tailgating at the big game, the Catalina Creations Solid Copper Portable Folding Fire Pit is up for the challenge. 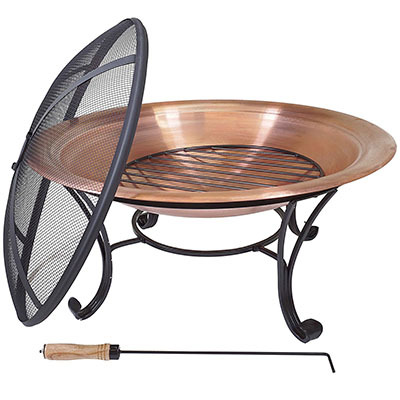 Weighing in at only 13 pounds and boasting a unique folding design, this portable copper fire pit is perfect for at home or on the go. The 26” wide, 9” deep bowl is an excellent size for small to medium outdoor spaces, yet still has enough room for a cheery blaze. We loved that fact that no assembly was required and the fire pit was ready to go straight out of the box. The powered coated steel base and spark screen have superior corrosion resistance and we found them both to be very well built. As for the copper fire pit itself it was a brilliant polished design made from medium gauge copper plate, perfect for reducing weight without compromising durability. With all that being said, the Cataline Creations Copper Portable Folding Fire Pit is an exceptional option that is perfect for those who like to take their fire pit on the road. The ingenious design and a top notch carrying case make this an excellent addition to our list and a great buy. If you’re looking for a more unique fire pit, the square design of the Titan Outdoors Square Copper Fire Pit should fit the bill perfectly. The 33” x 33” copper fire bowl provides an incredible 1,089 square inches of available space and is perfect for large patios and backyards. We were impressed with how well the 6” deep fire bowl was able to reflect heat and how easy it was to make some exotic fire pit recipes over it’s wonderful flames. The top of the bowl stands at 14-1/4” high and is just the right height to warm your hands or toast some smores. If your more into just relaxing by the flames the included square log grate, spark screen and poker are all great for a relaxing evening. During our tests we found the copper used in this fire pit to be very high quality and extremely thick which is perfect for extended outdoor use. We also determined the elegant steel base had an equally high build quality and was powder coated for a weather resistant finish. Another excellent addition to our list of the best copper fire pits, the Titan Outdoors Square Copper Fire Pit thoroughly impresses us with its robust design, included extras and unique square design. We would have like a drain hole, but that can easily be drilled after assembly. By now you’ll have notice Titan products have appeared on this list more than a few times, and for good reason. When it comes to the best copper fire pit, Titan Outdoors is known for making some of the most durable and elegant ones on the market. 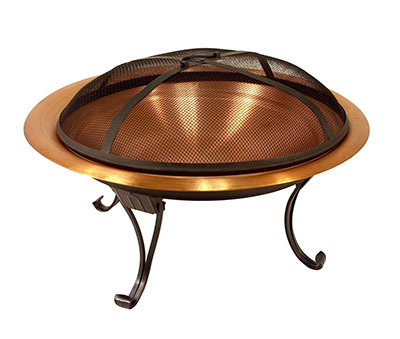 The Titan Outdoors 29” Copper Outdoor Fire Pit is no exception. 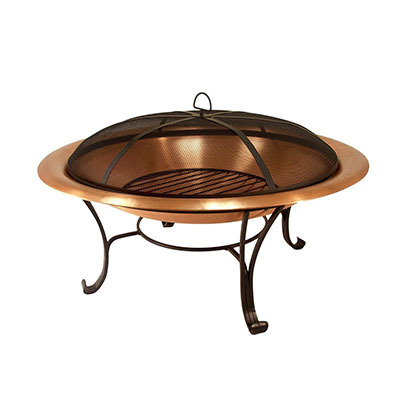 With a medium sized fire bowl that boasts a 5” deep center, this stunning copper fire pit can hold its own next to the others on our list and can easily fit 4-6 guests around it. We were impressed with the gorgeous polished copper finish, refined steel based design and the overall durability of the entire unit. Similar to the other Titan offerings, this outdoor fire pit comes fully loaded with a spark screen, log grate and fire poker so you have everything you need straight out of the box. Once used for the first time this fire pit begins to develop an incredible patina that really adds some character to your outdoor space. As a lower cost alternative to some of it’s more expensive competitors, the Titan Outdoors 29” Copper Outdoor Fire Pit will truly add some elegance to your back patio. Plus, with such a durable design we can easily see this fire pit lasting for years to come. 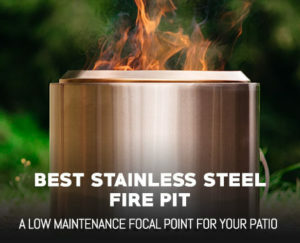 If you’re looking for the absolute best copper fire pit that is made from the thickest gauge copper, has an elegant design and will last for years, go ahead and buy the Titan Attachments Copper Fire Pit Bowl. 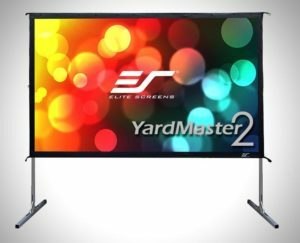 It is bar none the best on our list and easily tops the competition with its stellar features. The Cataline Creations Solid Copper Fire Pit is an excellent alternative as well with similar quality but at a slightly lower price point. 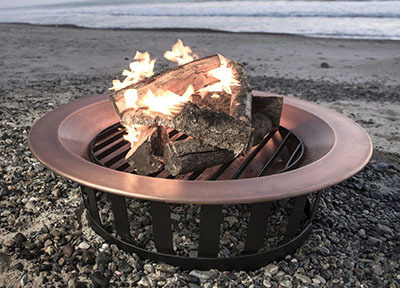 If instead you’re on the hunt for something a bit more portable, the Catalina Creations Solid Copper Portable Folding Fire Pit is what you’re after. With a foldable design, high quality copper fire bowl and the lightest option on our list it is perfect for all type of outdoor activities. In the end though if you choose any of the fire pits on this list we can assure you that your patio will look 100% better with such a stunning conversation starter and focal point. If after reading these review you still haven’t quite found what you’re after, you might consider checking out our fire pit buyers guide for additional options, tips and help choosing the right fire pit.